You will like to become a stock broker? We’ve all heard about how much money they stand to make each year in bonuses and salaries. We’ve also seen the type of lifestyle they live. Movies tend to glorify the work they do. It would, therefore, come as no surprise to learn then that you would like to join their ranks. Get a good education. It always used to be the case that if you wanted to be involved in the stock market, either selling and buying stock as a broker on behalf of your clients or as a trader and investor of stocks, the level of your education was not of paramount importance - what counted then, was that you knew how to make money for both yourself and your clients. Today, however, things have become far more competitive and so if you wish to become a stock broker, it is important that you graduate from college. Ideally, the education you will undertake will be two-fold. On the one part you need to know something about math and how to invest money. On the other hand, you also need to know how to get access to information in short notice. Therefore, if you want to know the basics of how to become a stock broker you need to make sure that you educate yourself on both of these, as they are sure to play a major role in determining whether or not you can become a stock broker. Knowing how to play the market It is extremely unlikely that other people are going to part with their life’s savings if all you know is theory - with no practical experience! So, similar to becoming a photographer or artist, if you want to know how to become a stock broker then it is important that you start your own investment portfolio that can track your investment successes. You can then use this portfolio as a showcase to try and make sure you have the trust and confidence of others when it comes to showing you know how to trade on your client’s account. You will need to undergo a series of tough on-the-job workshops. This training will provide you with much needed and relative experience in knowing which stocks to purchase and sell - but essentially also how to select stock. In most securities brokerage firms you will likely be asked to undertake up to 6 months on-the-job training, as well as some theoretical challenges, such as Series 7 and Series 63 exams. Once you have completed these, you will then become a qualified stock broker who can trade with his own clients’ accounts. Keep in mind, however, that during any formal training period you are unlikely to be paid vast sums of money, while at the same time being expected to work long hours. Fortunately, in these days of modern communications systems, one aspect of how to become a stock exchange broker that you may want to consider is how to become an online stock broker. In the event that you would prefer to become an online stock broker, much of the formal training that you would receive working for a securities brokerage house will still be needed, i.e. you still need to be qualified and licensed to recommend stocks to your clients, but you will be offering your services online. You can get more information from stockbroker career guide. For example, many online stock brokers will not take as much day-to-day care with their clients’ accounts as stock brokers working in Wall Street might be expected to undertake. Once you have completed all of the above, you’re well on your way to becoming a high paying, full-fledged stock broker. 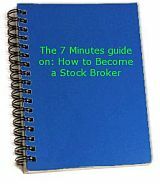 To complete the final step on how to become a stock broker, however, you will also need to learn how to have an extremely competitive streak to your personality - with lots of patience if things do not work out as you first thought they would. Unfortunately it is this last step that catches most people out because, unlike all of the rest of the steps on how to become a stock broker, this last step cannot be taught, rather it is something that you have to be born with.